Dust off the nets, lacrosse season is underway! The West Kootenay Minor Lacrosse Association will continue to host a practice group in Rossland in 2019, if there is enough player interest. First practice in Rossland Arena! 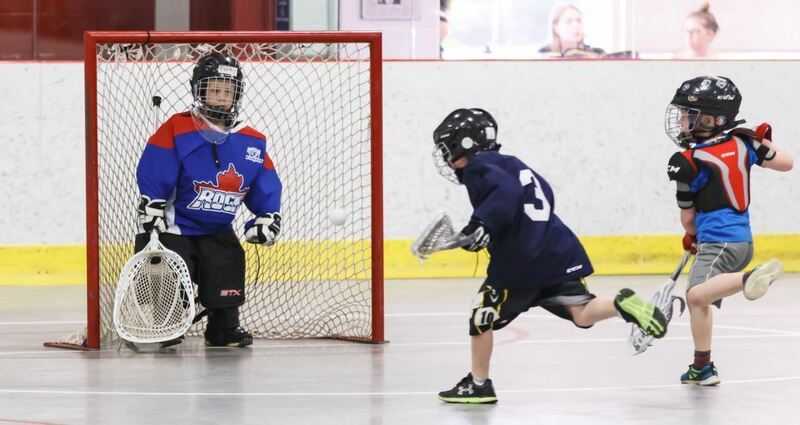 The Rossland Arena echoed with laughter and bouncing balls on Monday, as the West Kootenay Minor Lacrosse Association (WKMLA) kicked off its 2019 practices. Until April 11, WKMLA is offering free practices to players interested in trying the game hands-on before committing to joining its organized box lacrosse program. The WKMLA program currently operates primarily in Castlegar because of its central location to a large catchment area: the West Kootenays. With a growing number of players, WKMLA launched a practice group in Rossland for Lower Columbia players, ages 4-10 in 2018. Coaches are in place for 2019 and WKMLA is planning to offer practices to ages 4-12 (mini-tykes to peewee) if there are enough players registered. The new practice location increases accessibility of the local box lacrosse program to players from Rossland, Trail, Warfield and Beaver Valley. Players in the mini-tykes to peewee divisions have the flexibility to attend practices with the Castlegar or the Lower Columbia groups. The mini-tykes to novice age group will go to Castlegar for occasional intra-association games and tournament team practices. Tournament team practices for peewee are in Castlegar due to registration numbers. WKMLA offers a program for players between the ages of 5 and 16, with divisions similar to those found in minor hockey. Box lacrosse is played indoors on an arena cement floor with six players per side. For players 10 and under, the season runs to end of June or Canada Day week-end. Older divisions participate in Provincial Championships in July.